Winston Churchill wisely said ‘let our advance worrying become advance thinking and planning’, a concept which I’ve clung to these past few weeks. Every project I try to turn worry and over thinking into planning, in the hope of avoiding any major slip ups. Inevitably each new development teaches me the hard way what I’ve missed! When dealing with multiple contractors in a very short space of time, if you don’t want decisions to be taken on your behalf, you need to provide them with detailed plans. Not only should you provide plans for absolutely everything you can think of, but also what anyone else may think differently than you about, as what may seem obviously to you might not to them. If you don’t and problems arise, understandably there may be very little you can do about it. After running a check on the final electrical fix, it became clear to me there had been a mix up with one of the downstairs circuits. The hallway circuits were split in two, separating the entrance and the stairs, with the switch on entry controlling the spot lights on the stairs rather than lighting up the whole corridor. To me this had seemed clear, but miscommunication can often happen on site, so I was grateful to have a plan to refer back to. Luckily for me after one quick email, and a discussion over the plan, they were back on site to amend the mistake. 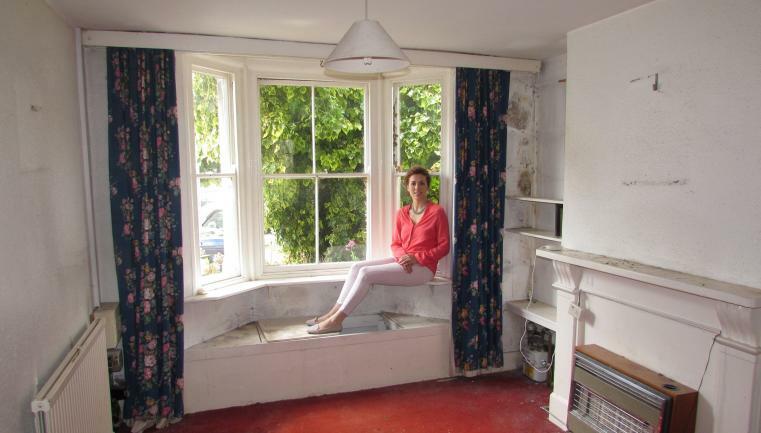 When we first bought the property, myself and my partner dreamt of ripping up the carpet to discover stunning Victorian floorboards but once we did we both has very different views on what we had found. 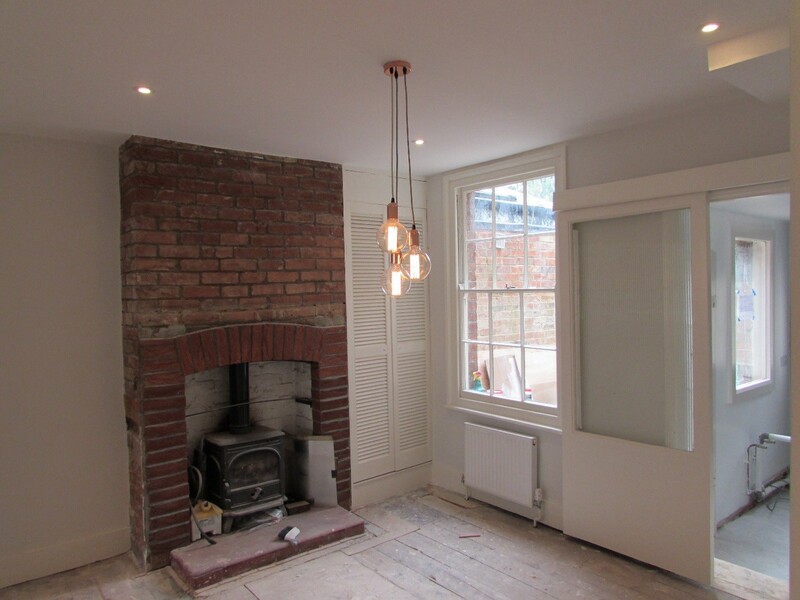 For weeks we debated about what we should do; whether to keep and restore the floorboards or start a fresh with new walnut flooring, but after realising we only had 2 more weeks left of the build it suddenly dawned on us that the decision had to be made one way or another. After a very informative meeting with ACH flooring we decided to restore the existing boards, but as they were in too higher demand to be able to meet our now minute timeframe, the task fell on us to do them at the weekend. After filing in the quite damaged ancient planks, we hired a sander from HSS tool hire and began the tiresome task of sanding them down. After 2 days of sanding we looked around to realise the house from top to bottom had changed colour, and now had a new coating of dust. After 4 hours of hovering, we finally managed to begin the painting. We decided rather than staining the wood we would opt for a more contemporary finish of a cement grey, which I’m happy to say has worked wonderfully! I find deciding the colour scheme for a project one of the most enjoyable tasks, and for the first time I wanted to trial a grey theme throughout the majority of the house. 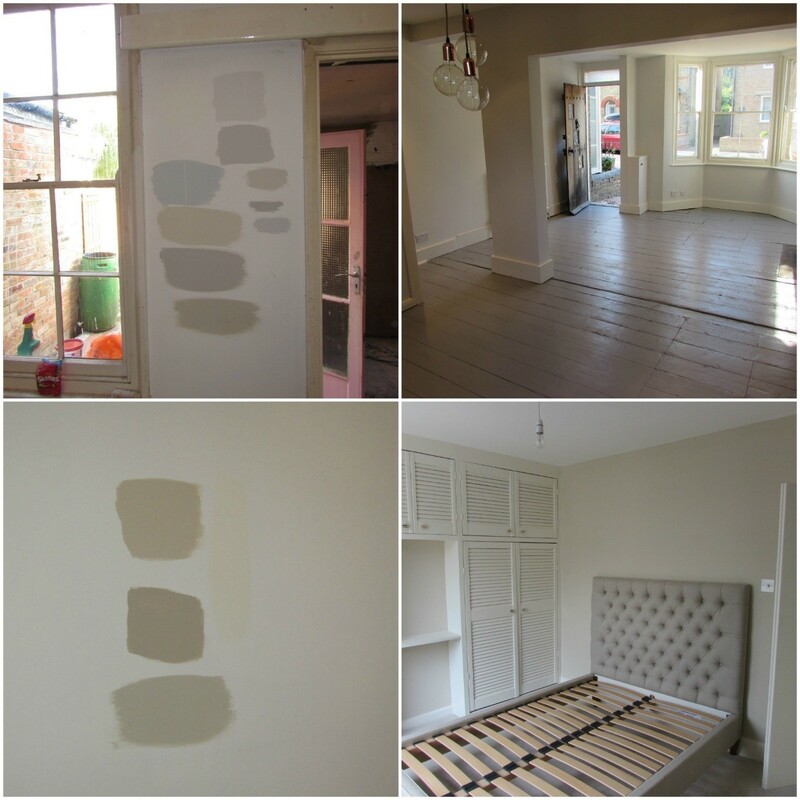 After testing multiple paints from Farrow and Ball I settled on Strong White for the walls and Pointing for the woodwork. The brilliant thing about this paint is it looks completely different depending on the light levels in each different room. In the brighter more light filled sitting room it’s a subtle off white, which will work well with all my colourful cushions, but in the slightly darker dining room it’s a blue grey. In the master bedroom I opted for Joa’s White on the walls and Pointing on the wood work. Joa’s white is a really warm and inviting tone, the exact feeling I wanted to create in our bedroom. The difficult task of demolishing, clearing, rotavating, raking and levelling our garden fell to my much better (and stronger) half Guy. After four skips full of rubbish was cleared from the garden he began the task of levelling it. 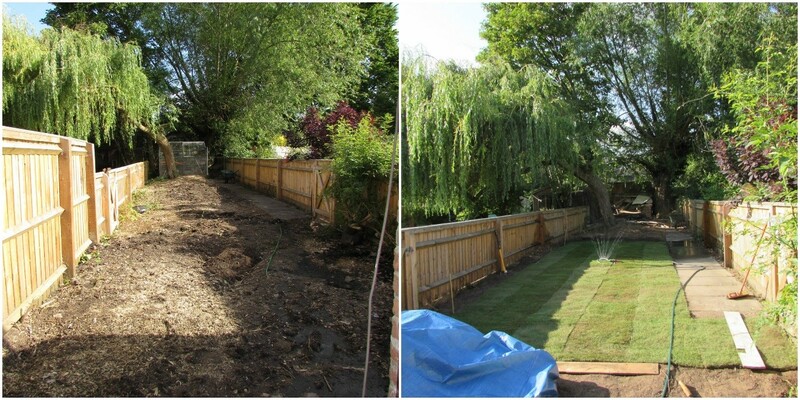 Against professional advice we decided to lay the first section of lawn prematurely as ideally you would lay in the autumn, but we were keen to be able to make use of at least one section of our garden straight away. The wild flower meadow, trellises, borders, vegetable gardens and the wonderful water feature designed by my amazing mum, Monique Halloran, are all strictly on the back burner until some wetter weather.